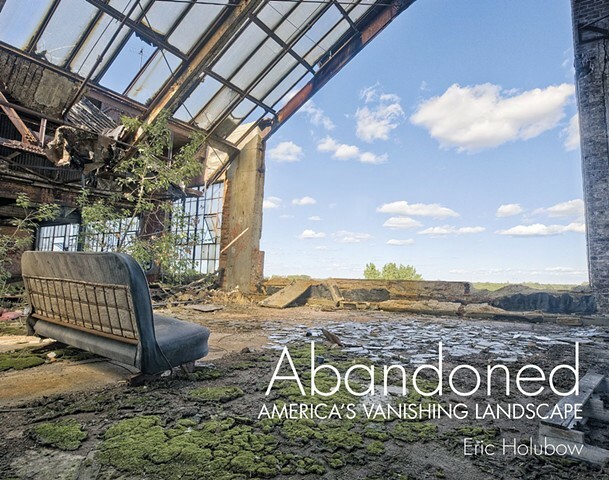 I'm thrilled to announce that my book Abandoned - America's Vanishing Landscape is complete. This hard cover coffee table book is a comprehensive collection of my urban exploration photography, including over 200 images from sites all across America. Produced by Schiffer Publishing a signed copy of the book is available through this website. For a relatively young country, America is rich in decaying ruins that cover its landscape. Through his striking photography, Eric Holubow provides a glimpse inside these perilous structures to reveal the slow but unforgiving wear and tear that has befallen many of the country’s forgotten sites. What transpires is a surprising, yet undeniable beauty beneath the rubble and decrepitude. Centered in the Rust Belt, but spanning from coast to coast, north to south, and big cities to small towns, breathtaking images of nearly a hundred sites, including factories, churches, theaters, prisons, and power plants, signify the comprehensive erosion of important parts of our history. Holubow's compelling work forces us to pay attention to formerly grand, significant landmarks and institutions that have long been ignored, and reminds us of the tragic fate that they and everything we know eventually share.